Symach announced the installation of its FixStation equipment at Rowley’s Accident & Hail Repair, a subsidiary of Axiom Accident & Hail Repair, which recently opened in January. Located in Loveland, Colorado, Axiom Accident & Hail Repair focuses on non-structural damage repair, glass repair, hail repair and paintless dent repair (PDR). The FixStation is equipped with a Flydry robot, Paint Mixing Room, a Vacuum Sanding system and a Multibox with plugs and retractable air and electric. Axiom Accident & Hail Repair also uses the Drytron, a portable gas catalytic dryer. “This allows us to use the same drying process when applying body filler and primer outside of the FixStation,” said Park. Park first learned of Symach equipment about a year and a half ago and was very impressed. He said they were looking for a piece of equipment where technicians could not only paint vehicles, but also repair them in the same location. As a result, he decided to incorporate the FixStation in his new business model. The workstation allows technicians to remove and install parts, pull dents, apply body filler, spray primer and spray and dry waterborne/solvent basecoat and clearcoat. 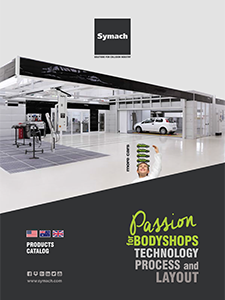 “Symach’s FixStation is truly a body shop in one box,” explained Osvaldo Bergaglio, CEO of Symach. “This hybrid solution works as a spray booth and workstation, all in one spot.” Utilizing the FixStation, Bergaglio said one multi-skilled technician can perform an average of four repairs per day without moving a vehicle, which results in one repair every two hours. Since installing the equipment, Park said the business has found that it has helped with the business process and provided high productivity and fast delivery of one and two-panel repairs. “It has provided continuous workflow throughout the shop, which is enormous for us,” he said. “We can go from PDR to conventional, to prime to paint without stopping.” Park said they expect that 85 percent of all repairs they perform, including roof replacements, to be completed within 72 hours. As an example, the facility completed a $13,000 repair in three and a half days “The biggest thing is trusting the process,” said Park. “You have to be nimble in your thinking and open-minded.” After the equipment was installed, Symach spent time training the staff at Axiom Accident & Hail Repair. “Their team is highly professional,” said Park. “There was never a communication point or a document or a conveyance of any sort that wasn’t 100 percent top notch.” Park expects to open two additional locations this year and incorporate Symach’s equipment. The long-term goal is to open 37 facilities across the country in high-frequency hail markets. “By giving our technicians the most technologically advanced tools, such as the equipment from Symach, we are able to ensure the highest quality repairs from beginning to end,” said Park.